Rod Coyne’s exclusive canvas print Summer Field is only available through Avoca Gallery and is the perfect gift for art-lovers or someone starting their art collection. This canvas fine art print available in small, medium and large sizes. It is framed and the price includes FREE world wide delivery. The Summer Field original oil painting is also available. Summer Field canvas print is derived from a painting completed en plein air by Rod Coyne in the heart of the Wicklow Hills. Designed from the outset as a triptych the three paneled composition encourages the viewer to see the landscape with new eyes; each canvas is a stand-alone painting and yet the three are bound together as one. “I’m in a summer field in Wicklow. My job is to share a little piece of the magic. 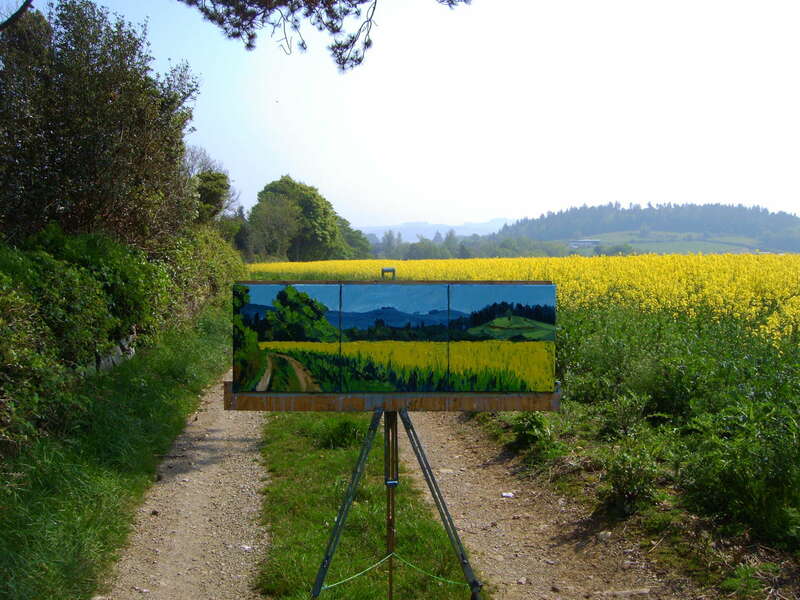 I set up my easel, salute the landscape in front of me and thank the Maker that that this is my task for the day. I start mixing colours and switch onto auto-pilot. I am a passenger during the painting process. My on-board Photoshop is constantly processing the vision before me. It’s an out-of-body experience as my eye sends signals to my hand. The job is done and I step back, exhausted and spent. I hope it’s the catch of the day. I’ve only recently heard of this “new” concept of mindfulness. I have been practicing mindfulness for the past 25 years.” – Rod Coyne. Summer Field – from the hills of Wicklow to your living room wall. Summer Field canvas print – a Triptych with historical roots. The Triptych devise has its roots far back in classical art history. Triptychs originated as alter paintings explaining the bible teachings to mere mortals who could not understand the Latin mass. Usually they depicted the story of Adam and Eve and the key teachings of the medieval church. The outer panels were hinged and closed like a gate in front of the center piece and showing only a somber version of the allergy. On feast days the sides were opened up to reveal hell fire and damnation in all its pyrotechnical glory.